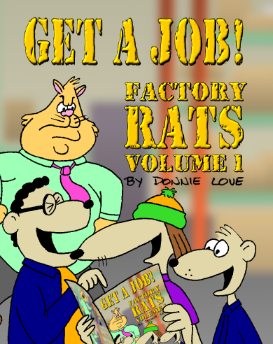 “GET A JOB!” the first book from Factory Rats is now available at Amazon.com. Follow the adventures of Taylor and Mole from the beginning and their very first day at the factory. “Get A Job!” features comic strips from 2008 and 2009 as well as rare artwork and early conceptual drawings from cartoonist Donnie Love.